Woke up today and got the mood to have some half boiled eggs for breakfast. I used to love it as a kid and still do. When I was a kid, my dad would bring us to coffee shop for breakfast before dropping me off to my school. We did not go to the coffee shop on a daily basis but whenever I have my school examinations, my dad would normally treat me for a good breakfast. It some how made me looked forward to having examinations because of the breakfast treat. The night before the examinations I would sharpened all my pencils and ready to rock and roll. I also like school examinations is because you are not required to bring all your text books and short school hours. Normally per day is just two subjects and by 3 hours you are done and free to go home. The school examinations normally take about 3-5 days. So for those days, I know I will get to go to our favorite coffee shop for breakfast. 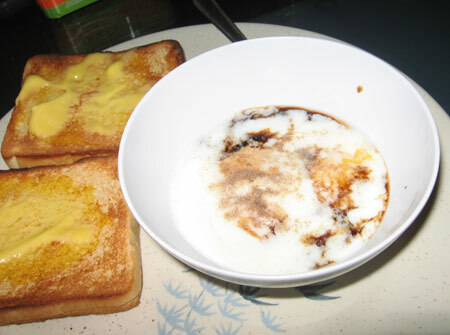 Most of the time I would order half boiled eggs, toasted bread with butter and teh-o ( tea without milk ). Making half boiled eggs is really easy. 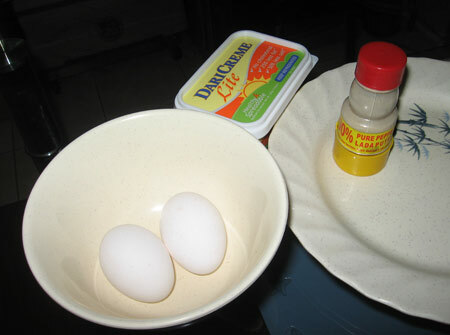 Here are some pictures and steps on how to make half boiled eggs. 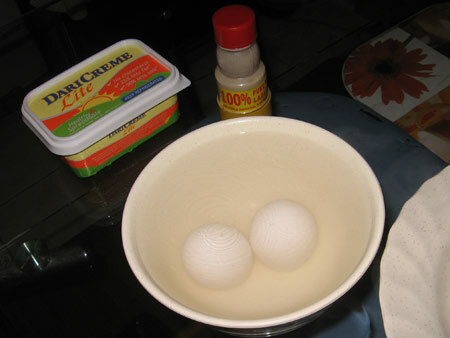 When hot water is ready, simply pour the hot water in the bowl and make sure the eggs are fully covered by hot water. Look at the clock and we just need to wait for 15 minutes to make a perfect half boiled eggs. 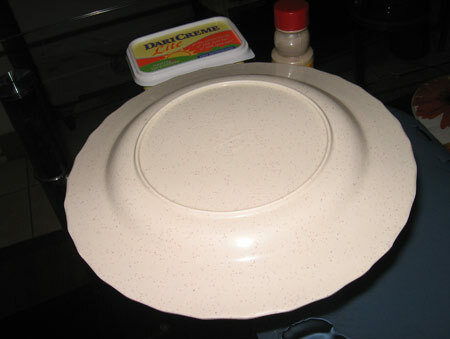 Cover the bowl with a plate to avoid hot water getting cold. While waiting for the eggs to be half boil, is time to make our coffee or tea and toast the bread. After 15 minutes, we can take out the eggs and break it and placed it in a bowl. Put some soya sauce and sprinkle some white pepper. You are good to dip the toasted bread into the eggs. Timing is really important when it comes to make a perfect half boiled eggs. If is less than 15 minutes, the eggs will not be perfect and you will not see the egg white. The egg white will appear to be transparent in color which is not good. If is more than 15 minutes, the eggs will appear to be too hard and not in liquid form. The yolk will be too hard and is not so nice to dip your toasted bread in lumpy egg yolk. I was shocked when I see a family run coffee shop selling toasted bread and half boiled eggs upgraded their business to the malls. What used to be really cheap breakfast is now 3 times more than the usual price. This is due to the packaging and cost of rental operating in trendy malls in Singapore. The company is known as YA KUN and is now doing very well. Initially I thought it will not work well as this is not something that is hard to make. Further more, this half boiled eggs can be found in any coffee shop around Singapore for way cheaper price. I was proven wrong with my thoughts and YA KUN did prosper and kept opening new branches in all the trendiest mall in Singapore. This is the reason why the owners are millionaires and I am not. They had the vision to package the product like StarBucks coffee. If you asked me why people are willing to pay 3 times more, I would most probably conclude that it is because it is convenient and trendy. Since you are already shopping in the mall, you will not go look for a coffee shop just to get cheaper version of toasted bread and half boiled eggs. YA KUN is still growing and is open for franchise. From what I read in some articles before, YA KUN is now in Indonesia and Vietnam as well. A successful business will always be copied by others. Currently in Manila, I’ve seen a few shops with YA KUN concept but it is known as Kopi Roti. I’ve no idea how good it taste but seems like the Filipino are embracing it. I’ve seen branches in Malate, Greenbelt and Katipunan. I remembered when my Filipino friend was in Singapore, I brought him to YA KUN and he told me this business can be done in the Philippines. I was a bit skeptical as the price point would need to be a little bit high. It would have to cost somewhere around 130 pesos for a set of coffee, toasted bread with palaman and 2 half boiled eggs. To me that’s pretty costly for some breakfast that you can prepare yourself with way lower price. After a few months, we saw Kopi Roti doing business and selling the same products. Seems like they are doing pretty good as they even have branches in MOA. Again this is why the owner of Kopi Roti is making good money and I’m not.